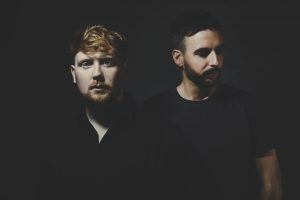 CARLOW town duo Darragh O’Connor and Jack O’Flaherty, known as Exiles, have been receiving nationwide media attention since the release of their latest single Rearview mirror. With Jack as front man and Darragh on keyboards, Rearview mirror is a perfect slice of 1980s-inspired pop that’s gaining plenty of attention across radio and social media. The song was released last Friday and launched on Saturday at the band’s gig in Scraggs Alley on Carlow’s Tullow Street. It has already been named on Beat 102FM’s artist of the week slot and featured on RTÉ 2FM’s ‘Play Irish’ initiative, as well as receiving widespread airplay around the country. The gig was staged by Youngblood Music and Carlow Creative Collective, Darragh being a founder of both. The aim of the organisations is to connect and promote local creatives such as artists, photographers, illustrators and, of course, musicians. To find out about Carlow Creative Collective and Youngblood, go to Facebook on www.facebook.com/CarlowCreative or www.facebook.com/YoungbloodIRL.